Will he or won't he, and do we even care? 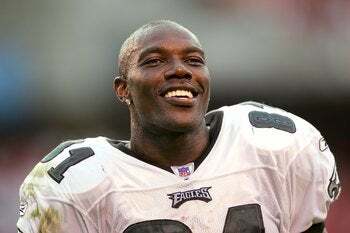 Noted upstanding NFL player Terrell Owens has had a long and storied career. He has caught a lot of touchdowns, and reached a Super Bowl. He's a great dude. HOWEVER, he has some MAJOR character issues. Case in point, his 2006 blockbuster novel Little T Learns to Share. A tour-de-force of plot, with twist after unexpected twist. Yet we, the reader, are left empty. Hollow. In place of gutted we are apathetic. Why is he named Little T? What must he learn to share? Why is his football in an Entenmann's box? The fact that noted author Mr. Owens fails to answer any of these important character details in the front cover indicates his book lacks the depth and complexity to make readers care about the characters.